Last week, I attended a foreclosure auction at the parking garage near an office building in Bellevue. Unlike most condo auctions where you will see a crowd of a couple hundred people showing up, there were only around 50 people attending this auction. Half of them were realtors just like myself trying to get an better understanding of how foreclosure auctions work. The other half were individual investors, aspring investors, and professional group investors assisting their clients in the bidding. For those of you who are interested in a foreclosure auction, this is how it works. When a bank forecloses on a property, they will hire a trustee (individual or company) to facilitate the foreclosure process. In King County, Trustee sales take place at two locations. One of them is in Bellevue and the other one is at the King County Courthouse in Seattle. They are required to be held in a public place so that members of the public can have access to view the auction. Auctions are held every Friday at 10am and 2pm. You can find a list of foreclosure homes on the USA-Foreclosure website. On this particular day that the auction was held, there were over 200 homes on the list. Three auctioneers were calling out in alphabetical order by the foreclosure owners' names, followed by address and then the minimum bid. Olive 8's auction event was this afternoon. Thirty two homes were auctioned off by Kennedy Wilson. They initially had thirty-four homes for auction but two of them, #1902 and #2102 were removed from the list. The homes were sold for an average of 66% of the previous listing price, which is very close to the average of the last few auctions (Queen Anne High School, Lumen, Brix, Gallery, and 5th and Madison) since 2009 at 67%. The average price per square sold for the auction was $450.78. This is by far the highest average price per square foot sold for all auction events. 1.) One bedroom's were sold for an average $462.69/sq.ft. and the average winning bids were at 68% of the previous listing price. Two bedroom's were sold for an average of $415.06/sq.ft and the average winning bids were at 60% of the previous listing price. 2.) One of the largest two bedroom homes sold for $625,000, 54% of the previous listing price. 3.) The lowest price one bedroom was sold for $297,000 (650 sq.ft.). One couple won the bid for a two bedrooms, two bathrooms for $702,000 (1,586 sq.ft.). It was the highest bid for the two bedroom homes but they were very pleased with the price. It's going to be their 2nd home. Each home has an unpublished reserve price, which means that the seller has set a minimum selling price. In the event the winning bid was lower than the reserve price, the winning bid is subject to acceptance by the seller. It would be interesting to see how many of these homes will make it to closing. Kennedy Wilson just released the starting bids for 18 homes in 5th and Madison set for auction on Sunday, March 27th. 1 Bedroom + Den/ 1.5 Bathroom, 978 sq.ft. 2 Bedroom/ 2 Bathroom, 1,957 sq.ft. FHA financing will also be available. More info here. 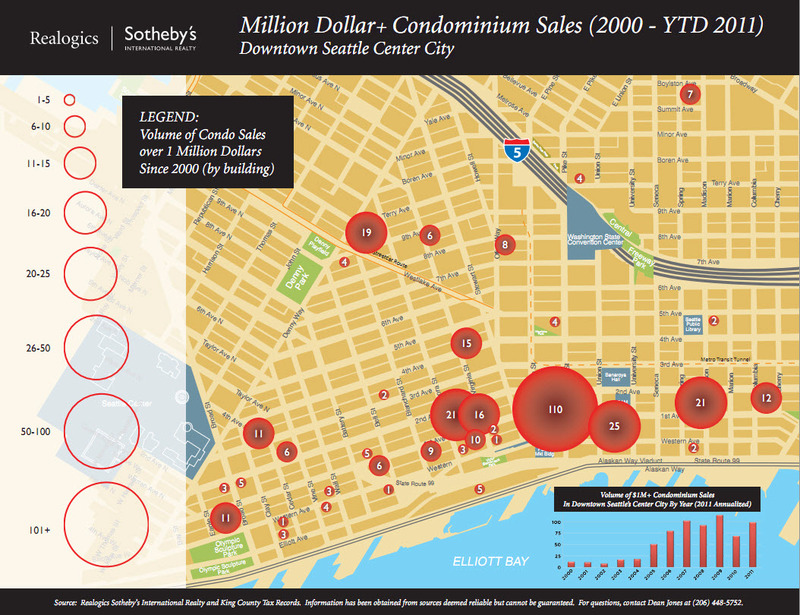 Four Seasons Hotel/Condo has reduced their prices on 13 of their remaining homes. I just received the latest price sheet. The price reduction ranges from 8%-47% with average price per square foot ranging from $1,097-$1,960. 5th and Madison is auctioning off 18 of their remaining homes on Sunday, March 28, 2010. Kennedy Wilson Auction, Inc will be conducting the auction. Kennedy Wilson successfully auctioned two other projects in Seattle: the Press and Queen Anne High School. Matt @ urbnlivn has more details.